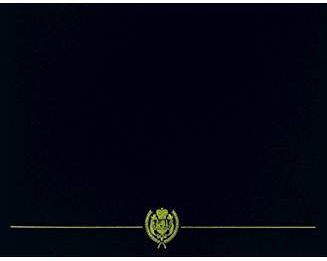 An unaltered photocopy of your auathorization letter or orders clearly displaying your award of the Commander's Award for Civilian Service medal. Don't forget to include an unaltered COPY of your authorization letter or document. 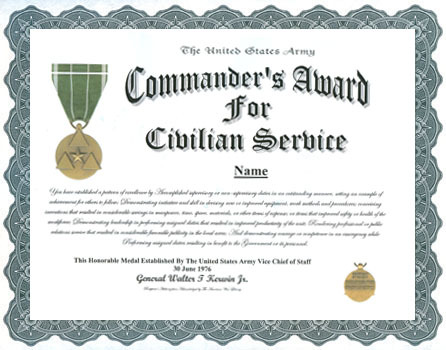 You have established a pattern of excellence by Accomplished supervisory or non-supervisory duties in an outstanding manner, setting an example of achievement for others to follow; Demonstrating initiative and skill in devising new or improved equipment, work methods and procedures; conceiving inventions that resulted in considerable savings in manpower, time, space, materials, or other items of expense; or items that improved safety or health of the workforce; Demonstrating leadership in performing assigned duties that resulted in improved productivity of the unit; Rendering professional or public relations service that resulted in considerable favorable publicity in the local area; And demonstrating courage or competence in an emergency while Performing assigned duties resulting in benefit to the Government or its personnel.